This story was set in a near future which in some ways we have already passed by. England is becoming a police state. London is crumbling and there is violence in the air. 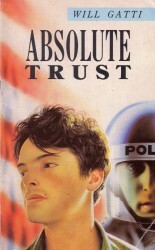 Demonstrations are attacked by thugs and nobody seems to trust anyone…The main character is teenager called Jeremiah Talent and his dad is the US ambassador in London. When Talent arrives for his summer vacation he finds himself a target and the friends he makes are not quite what they seem to be.